If you’ve ever been in a situation when driving where a motorist behind you (for an unknown reason) tries to get your attention, you’ll appreciate what a Massachusetts man went through recently in his home town of Hyannis. According to local news reports the man was riding in his car with his girlfriend when someone in back of him suddenly began urgently honking her horn when stopped at a traffic light. Since there was nothing obviously wrong with his vehicle the motive for the noisy auto outburst was confusing to say the least. What happened next came as a bit of a shock. “The man reportedly began recording the woman on his phone while he was outside of his car. The woman proceeded to drive around his car, prompting him to hurry back into the driver's seat, according to the police report. She then allegedly drove toward his car, clipping the open door. Just like that…a de facto instance of attempted murder just for featuring the word “Trump” on his car. Wacked out liberals hate it when anyone records their tantrums, too – that’s probably what sent the woman (identified as 25-year-old Chloe Wright) into a near-homicidal tizzy. Individuals suffering from acute Trump Derangement Syndrome love to hide behind anonymity while they’re shouting obscenities and accusations your way – but put ‘em on the record (with video) and they snap. Beware. The rest of the story isn’t particularly relevant but Ms. Wright has now been charged with assault and battery with a dangerous weapon (a car) in addition to vandalizing property and leaving the scene of a hit-and-run with property damage. You guessed it, she plead “not guilty,” too. One would hope with video and audio clearly depicting her violent exploits that the judge would throw the proverbial book at her. A little jailtime would not be out of the question for Ms. Wright – and besides, she’s likely to find many who agree with her politics among her fellow inmates. But with a Massachusetts magistrate overseeing the case who likely sides with Wright on the Trump issue…you never know…and we’ll probably never find out. The greater point is the most salient: what within the liberal mindset allows someone to suppose they could one, viciously disturb the peace just because of a bumper sticker and two, feel sanctioned to practically drive over another human being because of his political views? Maybe the man, when confronted by Wright for his Trump support, said something that inflamed the situation – set her off. But we have laws for a reason and mere words are never sufficient justification for initiating violence. If that were the case there’d be a thousand fights at every Yankees/Red Sox baseball game, wouldn’t there? Unfortunately this type of left-on-right incident seems to be common these days and one can only guess they’ll get even more frequent as America inches closer to this year’s midterm elections. 2018’s votes will determine the ultimate fate of Trump’s agenda and the economic recovery we’re enjoying this November. If Democrats manage to take over the House – and maybe even the senate – Republicans will find it a much tougher slog to get anything passed. Democrat control would also trigger all-out political war ahead of 2020’s presidential election, but it probably would be under any scenario. Do both sides have the stamina for a prolonged battle? Signs indicate Democrats may be losing their will. Julia Manchester reported in The Hill, “Democratic pollster Margie Omero on Friday said Democrats feel more ‘exhausted’ by the recent news cycle than Republicans. Assuming this poll is accurate, how can it be Democrats are more exhausted than Republicans by the news they’re hearing every day? After all, other surveys revealed nearly nine in ten Republicans now back Trump – and the stories flowing from mainstream establishment news outlets are almost all negative where the president is concerned. Shouldn’t it be conservatives and Republicans who are fatigued by it all? Could it be Democrats have been ground down by all the “winning” Trump brought to the GOP? Liberal pundits spin news any way they want but it’s pretty hard to effectively sell malaise when the economy is chugging along at over 4 percent annual growth, people have more money in their pockets (due to the tax cut), consumer and business confidence is high, unemployment is near record lows and Trump’s trade strategies are forcing real concessions from America’s trade partners (and competitors). Meanwhile, if anything, Democrats are rallying behind the socialism-promoting party faction led by Bernie Sanders and neophyte New York phenom Alexandria Ocasio-Cortez, the 28-year-old former bartender who’s promising voters everything under the sun -- including free nationalized healthcare (this despite reports that healthcare alone would cost over $30 trillion) and free college education. #NeverTrumpers and liberals claim Trump’s had an awful run of late (when have they not said this?) but his popularity remains steady and if his recent campaign rallies are any indication (in Florida, Pennsylvania and Ohio last week) the president is just hitting his stride to make a full circuit this fall. As I watched Trump deliver his speech to a frenzied Keystone State audience last Thursday night I was struck by how much energy the man has – where does he get it? Maybe only eating once a day (two Big Macs and two large fries) is the ticket to immortality. Or it could be Trump gains strength by refusing to shy away from letting the liberals have it – and it keeps him young. It drives his critics nuts whenever Trump hits back hard (as he’s been doing at the rallies) but a more aggressive return-fire philosophy is reaping political dividends by helping maintain his voting coalition. Perhaps there’s a lesson for congressional Republicans here somewhere – the time to play nice with the opposition is over. “Sorry, we dig you Nikki [Haley] (not so much some of the other people who decry our lib ownership initiative), but no one gets to tell us to chill anymore. To paraphrase Dirty Dancing, because of course it comes to paraphrasing Dirty Dancing, no one puts normals in the corner. It’s true; Schlichter’s a bit more “feisty” than most but being passive and rolling over at politics really doesn’t earn much love – at least not in recent times. For example, good guy John McCain refused to bring America-hating Obama pastor Jeremiah Wright into the 2008 campaign and it definitely cost him votes. Likewise, eternally weak flip-flopper Mitt Romney disregarded a golden opportunity to sock Obama with the Benghazi scandal a month prior to Election Day 2012, maddeningly neglecting to even mention it during a presidential debate. Democrats sit at the ready to drop rhetorical bombs at any time. If you doubt it just view any of Nancy Pelosi’s or “Chucky” Schumer’s press conferences. Schumer famously shed tears to add effect last year – what an actor. If you’re a Republican and can’t get yourself to fight back maybe you should vote someone into leadership who will – how about Jim Jordan for Speaker? “Own” the libs before they own you. Showing Trump support may tempt the occasional leftist motorist to attack you (above), but in the end it isn’t the meek who will inherit the (political) earth. If there’s anything to be learned from Trump it’s sitting back and allowing the media to take baseless pot shots at you isn’t a winning strategy. Be on offense – it should be the Republicans’ mantra from here on out. Failing to take it to the “enemy” will cost Republicans, especially since liberals are open about their desire to twist and contort all the recent good economic news. Roger L. Simon wrote at PJ Media, “[Liberals] pray to God for a depression, or at least a recession. Only they don't believe in God. So what do they do? How do we know this will happen? Because it’s exactly what liberals did during the 80’s when economic indicators were so strong they were virtually unimpeachable. Instead of complimenting and crediting Reagan’s regulation-slashing and growth-spurring tax cuts liberals grumbled about the swollen federal budget deficit and blamed defense spending for the bloat. Democrats fantastically suggested the booming economy only benefited the rich and the income gap widened into a yawning chasm during The Gipper’s tenure. Nothing could be further from the truth. The productive class made their lives better in the 80’s because they felt good about the country and knew the government was on their side economically. Simon thinks the left’s Trump Derangement Syndrome could potentially even cause an economic downturn now because people might believe all the media’s nonsense and adjust their behavior accordingly. Why do you think they used to call it (depressions) a “panic”? Here's thinking Trump won’t let anything happen but it’s still something to watch. These leftists are desperate, after all. Political commentators would be wise to restrain themselves as well. Victor Davis Hanson wrote at National Review, “Pundits should be careful with their sure-thing predictions, especially in the matter of a powerful, unpredictable, and explosive America. With the risk-taking and unconventional Trump — and the hysterical opposition to him — we are entering another unpredictable and volatile era in American history. Hanson argued human behavior often overcomes dire predictions and provided several historical examples of quick turnarounds, including the Reagan recovery in 1983. Nothing’s written in stone when it comes to Americans’ belief in their own abilities. 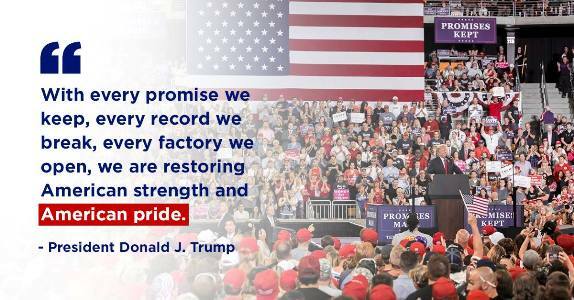 The current strong economy (after eight years of Obama) is proof of it.